As I got a little older, and my interests in the arts grew, I am sad to say that the dream never materialised. I also realised that I'd be rubbish in an emergency and would get bored of serving tiny cans of pop and snacksize pringles to disgruntled and nervous passengers very quickly. 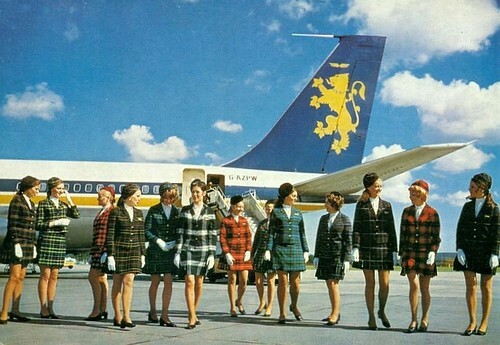 It did, however fuel a ebullient interest in the wonderful, winged catwalk that existed in our skies in the Sixties & Seventies. 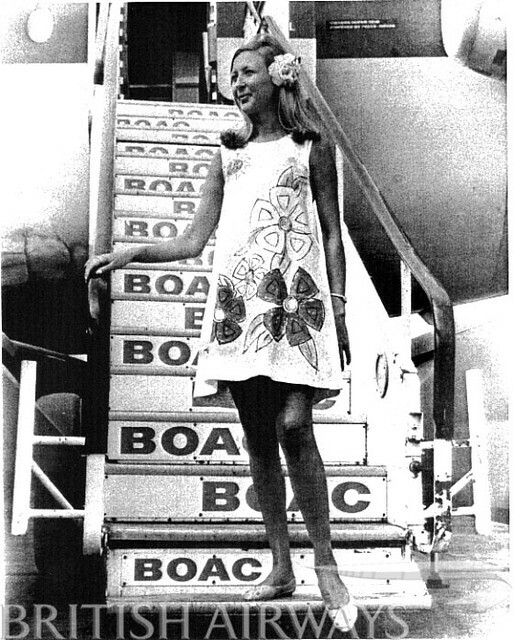 With the world literally at their feet, the stewardess of the sixties were noted for their notorious glamour; their lives were made up of fabulous tales of mischevious romances with the elite (as well as the Captains! ), and discreetly sipping champagne, 30,000 feet over the Atlantic. 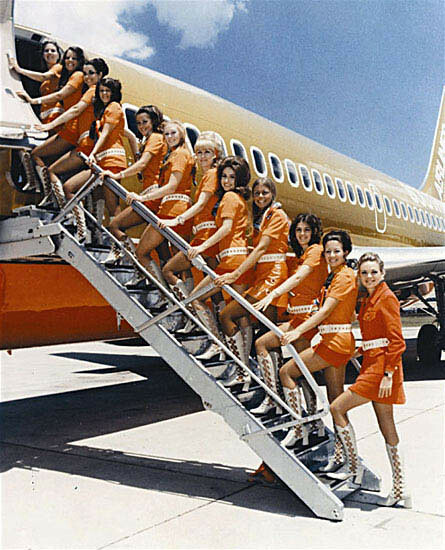 At that time, the position of an air stewardess was up their with supermodels & actress'. 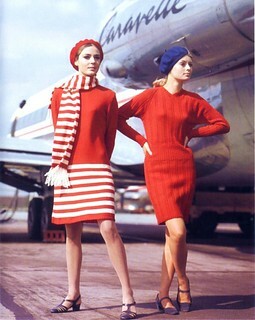 Berets and stripes for the French airlines! The girls were expected to have wit, personality and education and above all, great legs. 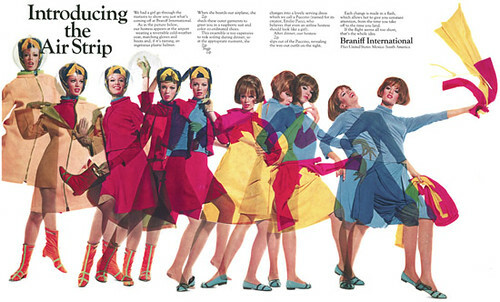 After the stuffiness of the fifties, airlines went to town in the sixties and fashion began to dominate the skies. 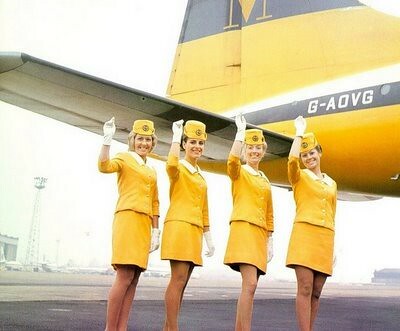 With regards to the uniform, conservative blacks and blues were dropped in favour of mesmerising concoctions of eye popping colour blocking, micro minis and even an appearance from the go-go boot! 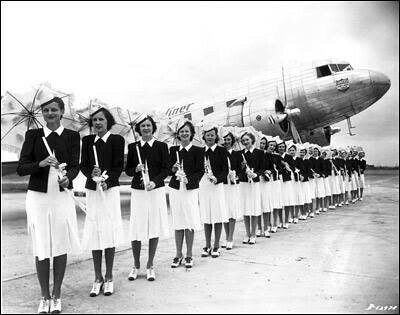 The hostess themselves were marketed as flawless, vivacious pinups, perfectly preened and wonderfully modelled outside the aircraft for press shoots like synchronised swimmers. 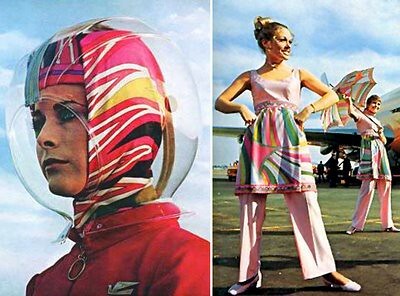 Emilio Pucca spearheaded the modernisation of Braniff Airways with their 'End of a plain plane' campaign by using bright geometric shapes, cheeky advertising & the creation of the incredible 'bubble helmet', a charming piece of sixties PVC designed to protect the steward's hair from wind and rain! Don't you just wish you could have been there!? And to leave you with something apt for our ventures into the skies today... the lovely, Thunderclap Newman's 'Something in the Air'... enjoy! 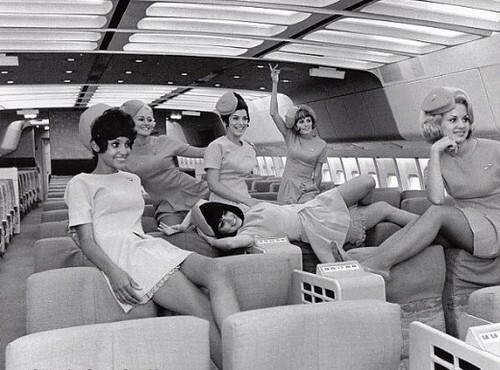 Oh 60s air hostesses are so beautiful!